Last night while I was putting the paper bag out, the scent of snow re-awakened a memory. Not my own memory, but the memory of my favourite Uncle when he was 17 years old. 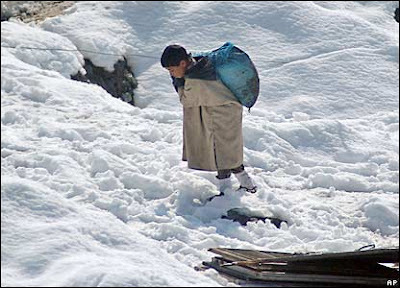 He was deeply in love at the time, and his misfortune was to be torn away from her for a family holiday in Kashmir. What could he do to prove his fidelity and steadfastness? He would bring back snow! So on the last night, he trudged up to the highest part of the mountain in Gulmarg, and filled a bottle with fresh scented snow. He capped it, and on his return to the houseboat in Srinagar, tenderly tucked it into the fridge, awaiting its long journey home to Bombay. That night he slept the sleep of the valiant, victorious lover. The next morning, to his utter horror, he discovered the bottle contained a mere quarter of its contents. A dribble of water. "Who touched my bottle of snow?" he bellowed. And my grandfather, equally horrified, confessed with deepest apologies. He had been terribly thirsty in the night, and discovering a bottle of cold water in the fridge, had thankfully glugged it down. Bottle of snow! What a cute story. We've about 8 inches on the ground today and a chilly 18 degrees F.
Shaista the blog looks amazing. I love this story and I love favourite uncles. I had one. You are so amazing and I love you. Angelique goes to see her nephrologist tomorrow. Wish her luck. the infamous cupasnow story...like it! has nadirshaw seen it? have you ever noticed how weird the word verification words below are? the one i am looking at now is 'unsuvule'. Who generates them i wonder? We have also soooo many snow !! Have you seen the film "Snow Cake." Please do, it's wonderful, one of my favorites. Winter smells like sunlight refrigerated in earth. oh my. how perfect. your new title, the story of snow, or love, of thirst...it all comes together. Nice to meet you. I'll come back soon. Thanks for sharing that great story. And thanks for stopping over by my blog to leave a sweet comment! Oh no! What a sweet story.